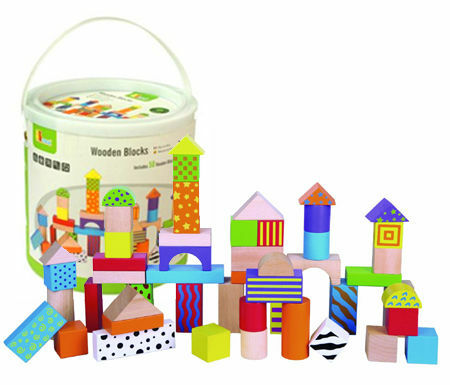 Blocks Wooden Fifty Piece Set is a great set of fifty brightly coloured and natural wooden blocks that will give hours of construction fun. The building blocks come in a handy tub with a push close lid, great for pack up and storage. There are many different shapes of block, cylinders, cubes, rectangles, triangles, arches and many more giving plenty of opportunity to build and build. Wonderful for imaginative play and motor skills these 50 blocks will keep your little one busy. Material: Wood with child safe paint. Heavy duty cardboard tub. We like this because: "It is great to find a tub of such pretty blocks at such a reasonable price."